At a flea market in Providence, RI, you can buy furniture, gifts, and food. This summer, residents were able to find something new as well : legal education. Together with the Providence Community Library, the legal service provider Dorcas International, and the Providence Public Library, Libraries Without Borders brought library services and legal resources into the neighborhood of Olneyville. 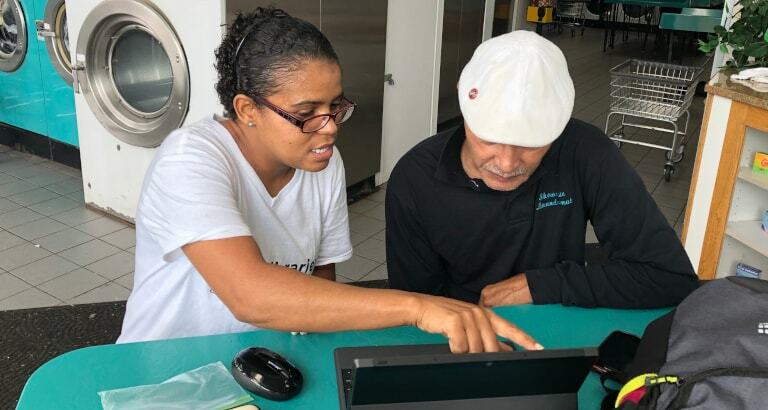 At the flea market, near the local bus station, and inside a laundromat, residents were able to use computer tablets to browse legal resources as well as information about learning English and job opportunities in their area. Libraries Without Borders recognized that for many communities of Providence, and particularly for the immigrant community in the Olneyville neighborhood, it is often difficult to know where to start with securing reliable services. In a survey conducted through the program, nearly half of local residents were interested in receiving help in immigration matters, even though only a small fraction of residents had ever met with a lawyer. Many immigrants may not know that low-cost legal services exist or that the library offers English-language learning classes. Of those who do, they may not know if they are eligible to receive assistance in the areas they need. Additionally, the growing threat of ‘notario fraud’ renders community members vulnerable to false or incomplete information that could jeopardize their immigration status. Other barriers exist too, noted the Project Officer, Betty Tavares. Most participants didn’t have an email address or know how to make a proper online search. Like the Wash & Learn Initiative across the US, this program, Legal Literacy Initiative, delivers the information communities seek in the places where people already are and in a format that suits their skill level. At each of these locations, there are long wait times. Sometimes the bus is running late; a single laundry load can take over 90 minutes. 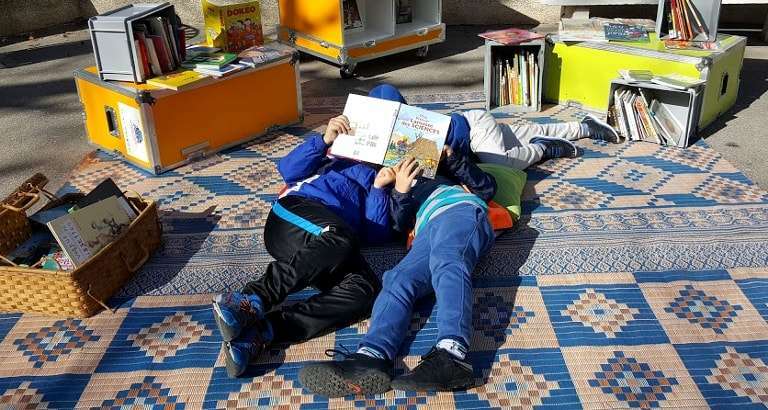 Libraries Without Borders repurposes these moments into opportunities for learning. As the program evolved, organizations added additional resources according to the concerns of participants. 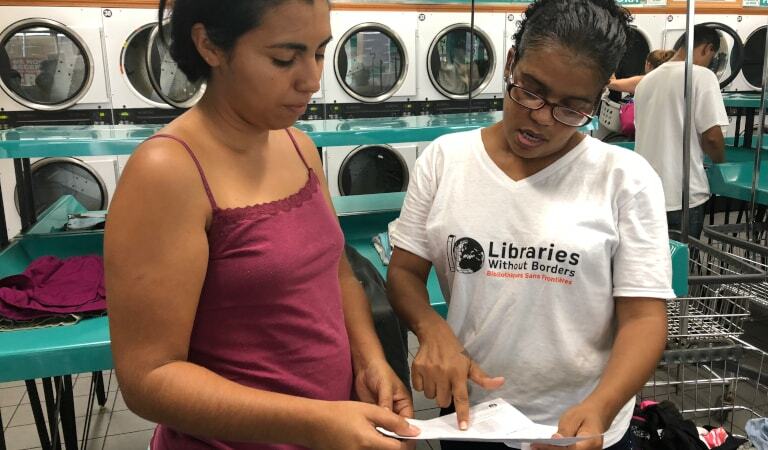 For instance, the Project Coordinator, Betty Tavares, noticed that many individuals were also interested in finding work opportunities and so collaborated with Libraries Without Borders to help participants find resume help and vocational training. To best serve the high percentage of Spanish-speakers in Olneyville, a majority of the resources were in Spanish. The Legal Literacy Initiative in Providence ran from July 24 to September 8 throughout the neighborhood of Olneyville. This work was supported by the Olneyville Fund at the United Way of Rhode Island. To learn more about our work in Providence, check out this segement on GoLocal TV and this article with the Associated Press.